Jupiter wire products are all of high purity metals with natural cotton or silk insulation. Plastic insulation and coatings can have strained or glaring sonic attributes which are unnatural to the ear. 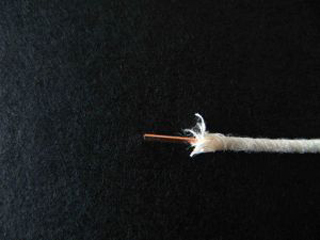 Cotton and Silk insulation acts as a ﬁbrous matrix for separating wires while maintaining a predominantly air dielectric, sonically very natural and open. 20 ga. solid copper. 4/9 pure, with unwaxed, unbleached, natural cotton spiral-wound insulation.